Never release an album a week before Christmas. 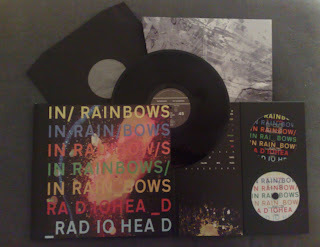 Sitting in the office today and watching the mail room wheel numerous similarly shaped packages around I realised that I was not the only person to have been waiting impatiently for Radiohead's album to arrive for the last 4 weeks. While I have been listening to the MP3s since November(? )I knew that the boxed set would be something special, which it certainly is. Two cds (only the first of which was released as MP3s), two 45's, two booklets and an amazing hard case. I'm a sucker for limited edition CD packs (like FSOL's 'Dead Cities' for example), and I knew that just having one in the house for the Very Understanding Girlfriend wouldn't be enough, so I ordered a separate one for myself. Eleven years on and the one thing that is still sacrosanct is music; there will be no mingling of music collections in our household, no sharing of CDs, no shared iPod, no single iTunes folder on our shared drive. I'm sure her CDs are perfectly nice, they just wouldn't be happy sitting with mine.